See it, Shoot it, Share it - The sleek Creative Vado comes in two colors - pink and silver. 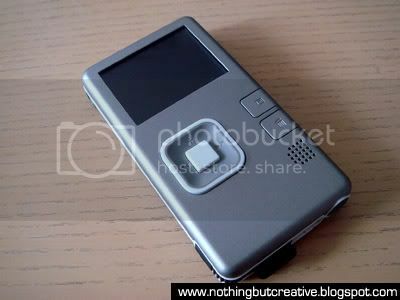 It has a 2" LCD screen, 2GB of inbuilt memory (no SD slot) and a removable battery. It retails at the price of SGD$169 (or USD$99.99 or £79). 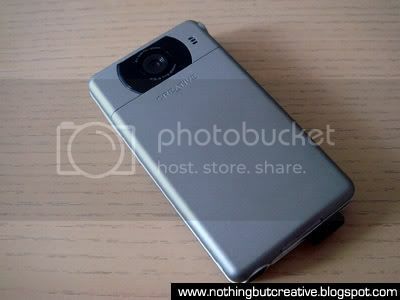 It has a 2" LCD screen that has a resolution of 640 x 240 (pixels). It measures 3.9" x 2.2" x 0.6" (100 mm x 55 mm x 16 mm) and weights 84grams with battery. The package comes with the Vado, a rechargeable battery and a quick start guide. The Video - The Vado can record up to 60 minutes of High Quality video and 120 minutes of Good Quality video. The rechargeable battery is stated to last for 2 hours before it goes flat. Videos are recorded as 640 x 480 MPEG-4 AVI at 30 frames per second. It also has a 2x digital zoom. There's really nothing to scream and shout about the Vado's video quality. The videos taken with the Vado are often washed out and over exposed. But to be fair to the Vado, it was never meant to take high definition video in the first place. Instead, the Vado is mainly targeted at the trigger happy, gen-X-youtube generation where convenience out weights quality. The Vado does serve its purpose well for taking candid moments or informal home videos. I'm especially impressed with its low light performance where recording in the night or dark places will no longer be a pitch dark screen with voices. For the best video quality, shoot in High Quality mode and never ever use the zoom as it will pixelate your video so much that it is almost unviewable. The Built - The Vado is light and slim and scores full marks for its user friendliness. It will only take you a few moments for you to figure out how to use the Vado. 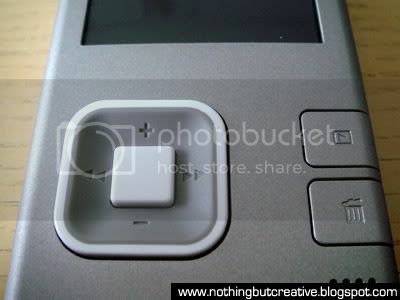 It has a 5 ways directional pad, a play button, delete button and a power button at the side. There's also a tripod mount at the bottom and an AV output outlet. The Vado has a built-in USB connector which makes it really convenient to charge and transfer your files. To use the express charge option, just press "Play" when the Vado is connected. To access its sub menu, press "Play" and "Delete" at the same time. The mic is located at the back of the Vado while the speakers are in front. The volume used to be really soft but after upgrading it with the latest firmware, the volume is now louder although it tends to crack when it gets too loud. When recording, the Vado will display a red light beside the lens. 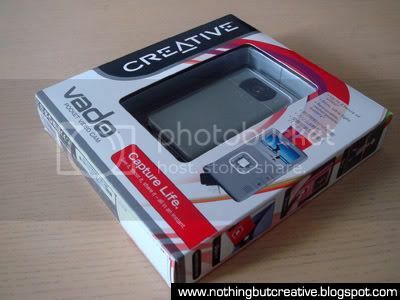 The Accessories - The Creative Vado comes with no additional accessories unlike the Flip. Avaliable separately, you have a spare rechargeable battery, AV cable, Charger and Travel Pouch which comes in 3 different colors. 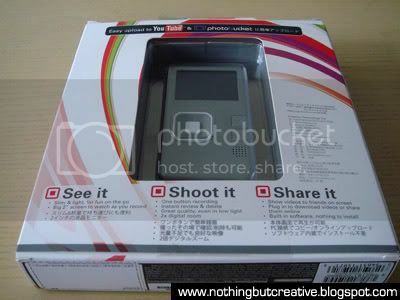 The spare battery won't come into much use if you have already filled up your camera's recording capacity and the charger is rather costly (SGD$45) when you could easily use a charger that has a USB outlet to charge the Vado. The AV cable that came with my ZEN Vision W works perfectly with the Vado and I think my Crumpler pouch looks much better than the Vado Travel Pouch. So honestly, you do not have to spend any money on the accessories as the Vado is good enough by itself. The Software - The Creative Vado comes with an in-built software called the "Vado Central" which will pop up each time you connect the Vado to your computer. However, each time I connect the Vado, the Creative Media Lite (which is used for the ZEN Stone series) will also detect the Vado and auto pop-up. The Vado Central will show you a thumbnail of all the videos you have in your Vado. 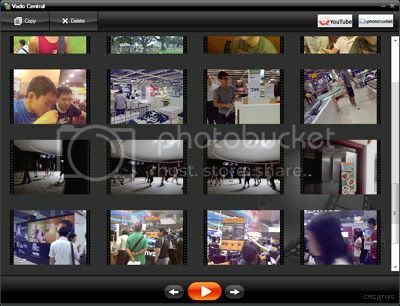 And then there's an option at the top for you to instantly upload the videos directly to Youtube, Photobucket or Box.net. The process is very slow for some reason however, even when uploading the videos thru Youtube itself took about the same time. The Vado Central only works with Windows (namely XP and Vista) however, if you connect the Vado to a Mac, the iPhoto programme will detect it and promptly display all your videos. Final Words - I had the Vado for a few months and I absolutely love it. Every time I whip out the Vado, curious onlooker will ask me if it's a new phone or camera and when I tell them it's the new Creative pocket video camera, they all seemed pretty impressed and interested. 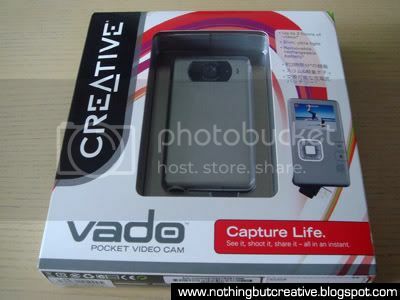 The Vado is a good alternative between my Sony Cybershot and JVC camcorder. The Sony Cybershot takes good video but the file size is way too big while my JVC uses tape which is pretty inconvenient to transfer the files. The Vado might not have the best video quality but it does what it does best - capturing those precious moments which might have otherwise pass us by forever. However, if the Vado could also take still images, that would have been perfect! The good: The Vado is cheap, slim and light weight which allows you to carry it everywhere you go. 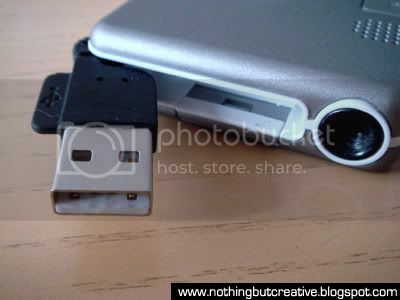 It captures video and audio in rather good quality and its in-built USB connector makes it a joy to transfer video to your computer. It has very good low light performance which is excellent for night and indoor recording. The Bad: It has no focus option which makes filming details or words impossible. 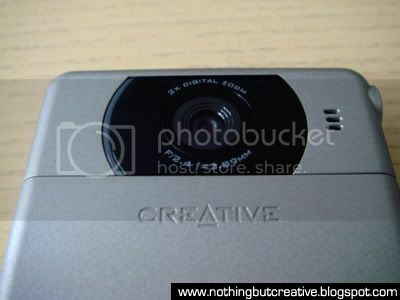 The native video format is not compatible with Creative's ZEN range of portable media players. Videos taken are usually washed out and over exposed. Lastly it can't take still images.